With Thanksgiving turkey a distant memory - replaced by omnipresent holiday Muzak, elves and the tinsel-laden decorations in nearly every retail storefront – the holiday season is officially in full swing. Competition has always been fierce for the holiday consumer dollar, but the success of Amazon and other digital-first retailers in the 2015 holiday season means that companies are competing more than ever for consumer attention, and cash. In the digital world, every lost sale (and your competition) is only a click away. That’s one reason it’s especially crucial that you pay attention to the way your digital customer experience does – or doesn’t – keep your customers engaged. To do so, you need to know what your customers are thinking, feeling and doing as they transact across various devices and channels. Ask yourself: Have you created an environment that keeps your customers attention and meets their needs? Or are you giving them cause for frustration, distraction, and negative impressions of your brand? One big reason these things happen is poor digital customer experience design. Of course, the three common examples below aren’t close to being a laundry list, but having a place to start is the first step towards resolving some of these common issues. Decision making criteria are unclear. Sensory overload is nice if you’re looking at a stack of wrapped presents (with your name on them) underneath the holiday tree. However, when it comes to your customers making decisions about the right product or service for them, too many choices, options and alternatives tend to confuse. The all-too-common kitchen sink approach gives users too many choices. This can result in option paralysis and stress for your customer. Think about the last time you looked at mortgage or credit card or health insurance options. As customers, we really need to understand what’s best for our unique situation. And as a business, it’s your job to make this as easy and enjoyable for your customers as possible. Good design can alleviate these problems. One key principle of good design is constraint. Think simplicity. Think essentials. Only include the information that benefits your customer, and structure it in a way that is easy and logical to access. For example, user choices should be clear and concise, and options streamlined. Customers should be able to find the right option in no more than three clicks – and be confident they’ve made the right choice. Your website (or mobile app, or service) has too many distractions. We live in an age of brand overexposure. In the early 2000’s, Jay Walker-Smith with Yankelovich Consumer Research was quoted as saying that “We've gone from being exposed to about 500 ads a day back in the 1970s to as many as 5,000 a day today." Gaak! No matter how many brand messages we’re exposed to a day, we all feel like it’s too much. Every minute of our waking lives, our ever-shorter attention spans are bombarded by numerous stimuli. Knowing this reality, why would a company compete against itself for customer attention? This is one reason that focus, simplicity and clarity are key elements to any successful digital-first design. Customers may not notice right away, but after they’ve clicked on an option that sends them to an irrelevant result, the effort it takes to retrace their steps and complete their intended task leaves them with feelings of frustration and annoyance. Good design is unobtrusive; it ensures that your customers experience the best your brand has to offer, in ways that are relevant to them, without distraction or interruption. Minimize or eliminate friction, so our customers will stay focused on, and be ab le to achieve, their goals and objectives. And when they do, you both win. Your digital experience ignores customer or user intent. In an interactive world, bad design applies at least equally as much to user experience (UX) as it does to visual execution. With people using different (and myriad) digital devices in many different ways, it’s not enough to simply make your tools and interfaces look good. The experience has to feel good to your customers as well – and when your customer’s intent is taken into account, and they can tell, customers do feel good. Bad interaction design overlooks the small things — literally. For example, it might forces your customer to struggle with unreadable or irrelevant links and tiny touch targets. By contrast, good design is all about the details. To exceed your customer’s expectations, anticipate their behaviors and intent at any specific moment or interaction and make your digital experience functional and relevant based on this understanding. 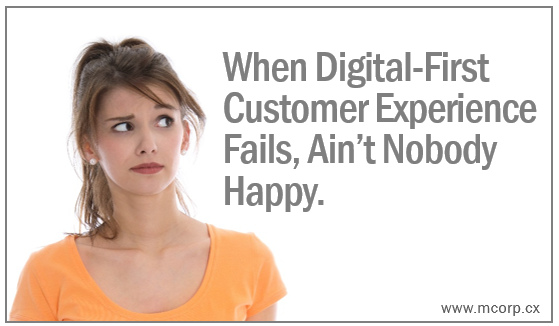 Just remember: your customer doesn’t care about “digital customer experience” at all – she cares about getting her job done, whatever that job is. She’s simply trying to change her flight or pay her bill or buy a product as quickly and painlessly as possible. And that’s it. Which is why if you’re unable to discern what she’s trying to accomplish (and make it as easy as possible for her to achieve it), you’ll lose her. And you know what? You’ll deserve to. Because any organization has the ability (if not the capability) to assess and address customer intent.